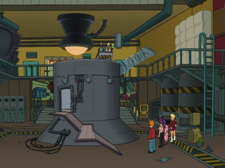 The maternifuge was invented by Professor Farnsworth who laughed at himself for creating it. When a DNA sample is taken from a pregnant person a number of people enter and those who aren't the other parent are ejected out. Zoidberg made it his home soon after it was made. It was used to determine who the second parent of Kif's children was: Zapp, Fry, Leela or Amy.